In June 1987, the Lotto NZ was founded, and the already existing Golden Kiwi game became the first lottery added to the system. The second game was added in 1989 and a bunch of other games followed with scratch card’s Instant Play being its latest addition in December 2017. Some of the games, especially the scratch card games have an age restriction, and people under the age of 18 are not eligible to play. 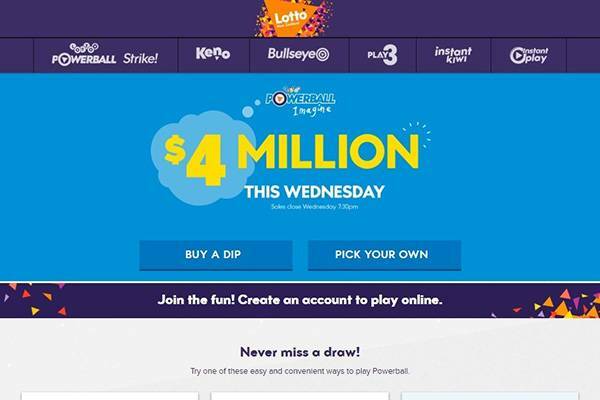 The Lotto NZ platform offers a reliable and credible gaming platform for New Zealanders to play lottery games. The Proceeds gotten from the draws Lotto NZ are channelling to organisations and developmental projects in the country. On yearly basis, about 3,000 organizations receive funding from Lotto NZ for the advancement of their community development projects targeted at bettering the life of the New Zealanders. So far, Lotto NZ has donated over $4 billion to the Lottery Grants Board. The Grants Board is in turn responsible for the supervising the distribution of funds between the different organisations. Some of these organisations that benefit from the lottery funding include Sports New Zealand, Creative New Zealand and the New Zealand Film Commission. Sectors of the economy like recreation, sports and arts are some of the major beneficiaries of the funds. Level of encryption or, in other words, what is the site’s commitment to keeping users’ detailed secured. Also, what regulatory compliance the lottery agent complying to. What are the lotteries offered on the site and what game modes are available. Also, we check if and what side games – such as Keno, Scratchcards, Instant Win, etc. – you can play. We test the site’s functionality and overall user experience – which languages and currencies it is supporting. All lottery agents offer some kind of Customer Support, and we review them. Being able to reach the site’s owners at any given time should be an essential aspect to any lottery player. 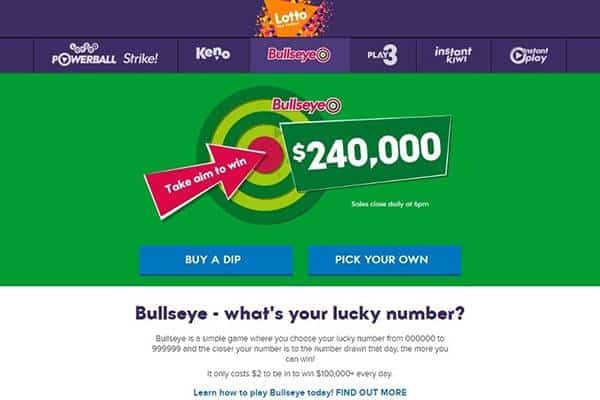 The major lottery games of the Lotto New Zealand are Lotto, Keno, PowerBall, Strike, Bullseye with two scratch card games – Instant Play and Instant Kiwi. The games are open for lottery draws all the days of the week from 6:30 am to 11:00 pm except on Wednesdays and Saturdays when the closing time is extended to 11:59 pm. 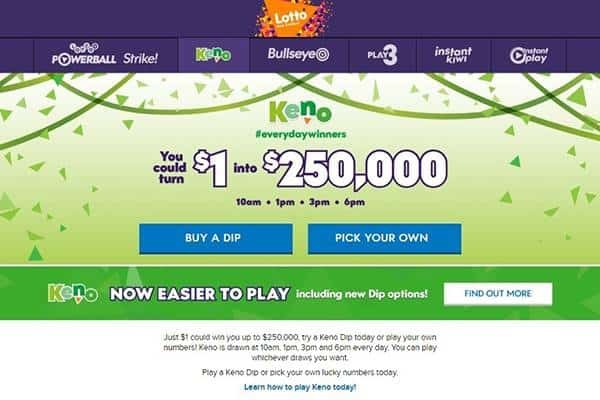 The Lotto game has a bi-weekly draw, the Keno game can be drawn a maximum of four times in one day while Bullseye and Play 3 are allocated just one daily draw. Lotto game has a jackpot of $1 million per draw while Strike has a top prize of $700,000. Lotto, PowerBall and strike are all linked as one game, although you can play Strike as a single game, Powerball can only be played as a link up to Lotto. A bonus tool for the game is called ‘Dips’. Dips are randomly chosen tickets that give a player a certain number of prepaid lines without having to select numbers of their own. The dip is in 3 tiers – the lucky dip for lotto, the power dip for lotto and powerball and the triple dip for all three games. Winners are expected to claim their prizes within 12 months of the draw date, or the win is invalidated, and the unclaimed money is returned to the prize pool. In 2014, the Lotteries commission officially launched the Lotto NZ mobile app for iOS and Android platforms. The app is directly linked to the Lotto gaming system, which allows for checking and buying of lotto tickets. However, players would still need to visit a retail outlet to claim prizes. Fortunately, all issued printed tickets can be checked. To check a ticket, all a player needs to do is scan the bar-code using the camera of the phone. Players can create accounts on the app and get notifications of wins from the system. 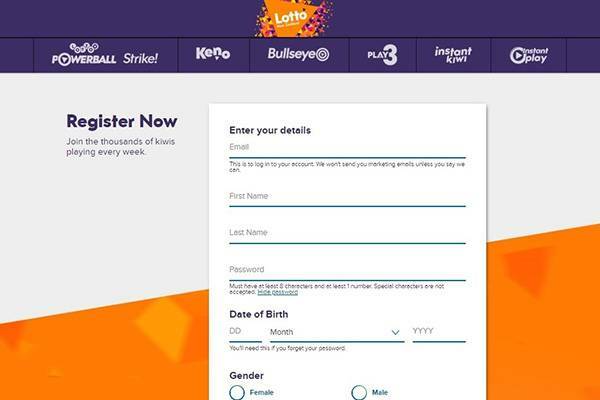 There are a bunch of promotions available on Lotto NZ, from Christmas to Father’s day to Mother’s day every celebratory event is a promo period for Lotto NZ. All cash prizes from the promo are paid either in cash or cheque to the winner. In the case where the cash prize is a car, the car is delivered to the delivery address of the winner, or it can be redeemed in cash for the money equivalent in a case where the car is no longer available. Nevertheless, winners must be 18 and above to claim a car prize. Other terms and conditions apply to promotional offers. All in-app transactions are made using the money in a player’s MyLotto account. Players can top up their account via internet banking or using credit and debit cards. The maximum and minimum top-up limits per week for every player is $150 and $1 respectively, and the maximum amount that can be held in the player’s fund is $999. Accordingly, players can also make transfers from their MyLotto account to a bank account with a minimum withdrawal limit of $10. Weekly and monthly sending limits for each account is restricted to $150 and $500 respectively. For claiming prizes, all non-cash prizes and cash prizes of $1000 and below can be claimed at all Lotto outlets within the country. For larger prizes over $5000, the winners would need to go to Lotto NZ headquarters in Auckland to claim their prizes. Once again, terms and conditions apply before winners can be given the price, for example, the winners are expected to submit the winning ticket at the terminal before they can claim any prize. 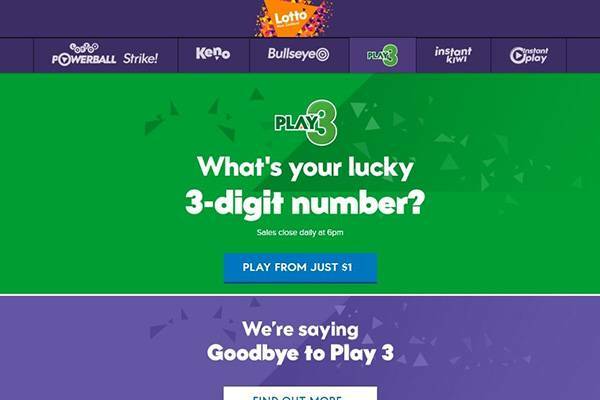 Lotto NZ has an FAQ page that addresses issues about MyLotto account, winnings, mobile app, tickets and gaming. 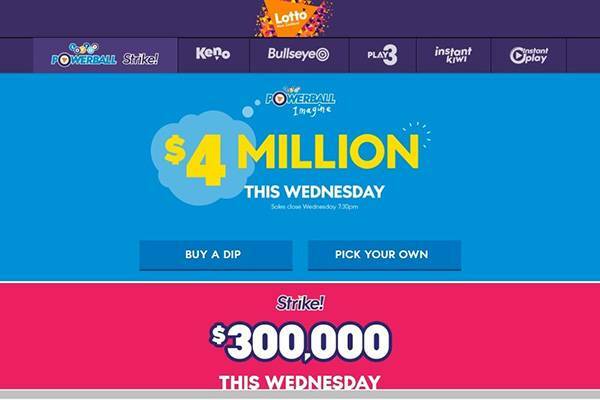 IS LOTTO NEW ZEALAND LEGIT? With a global ranking of 66,657 on Alexa ranking and an average of 7400 daily visitors, the Lotto New Zealand official website is as legit as it can be. As expected, over 90% of visitors are based in New Zealand while just a little above 1% is traffic generated from thе USA. The platform works in partnership with the Blind Foundation to enhance the site accessibility and is working towards the big goal is getting a WVAG level A compliance. Until then, the site seems to be at the best it can be. Other than offering a great gaming platform for lottery draws, Lotto NZ also contributes majorly to community development by donating lottery funding to some of the great causes in the country. From conservation projects like protecting the endangered species to a Life education trust for young kids, every time a player buys a lotto ticket, through Lotto NZ, they indirectly make a donation towards a better future.